KJ Apa, also known as K. J. Apa, is a New Zealand actor. 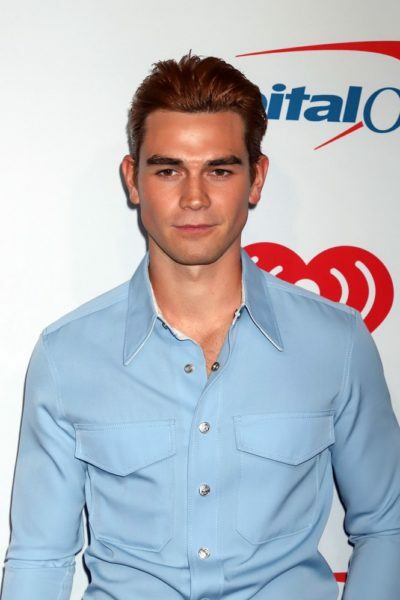 He plays Archie Andrews in the series Riverdale. KJ is the son of Tessa Apa, a writer, and Tupa’i Keneti Apa. His sister, Timena Apa, is an actress and model. He has Samoan, Scottish, and English ancestry. His Samoan family is from Moata’a. His surname, Apa, may be related to the name of the capital of Samoa, Apia. A picture of KJ with his father can be seen here. KJ’s maternal grandfather is John Russell Callander, a judge. …[my father is Samoan]. I have a massive Samoan family. And the Samoan culture has always played a massive part of my life. I’ve got hundreds of family on my dad’s side that live in Samoa and in New Zealand. I’ve just been surrounded by the culture ever since I was a kid. I actually used to speak Samoan, but me and my sisters all kind of lost it. We go there at least once a year to see family. And my dad recently just got a traditional Samoan tattoo. He’s a chief in Samoa, so he got that tattoo to commemorate it. Boy is in touch with his roots. I hope he keeps that going. When I first saw him on ‘Riverdale’ the nose and the hair (despite it being an unnatural colour to begin with) seemed off for the ethnicity he was portraying. Anyways, looks mostly white to me.. I don’t know, something about his nose plus his last name made me think maybe he had a distant non Anglo ancestor. his father is not fully Samoan. Unmixed Samoans are brown skinned. K.J.’s sister has inherited more Samoan features than him. When I saw his surname, I looked it up on Familysearch and thought he had Italian ancestry. There are Italian Apas. I didn’t know he was from New Zealand then. He’s 1/4.. I don’t know why media outlets keep calling him half or saying he’s only of “Samoan” descent.. I saw a family pic and his dad looks mixedish? I don’t know if it was him.. He is the son of Tupa’i Keneti Apa and Tessa Apa, a writer. His sister, Timena Apa, is also an actress, and model.